Observers are welcome anytime. 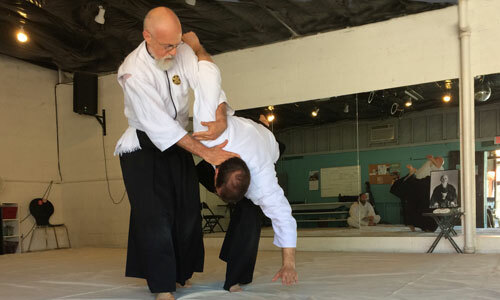 Wednesday beginner classes are slower paced and focus on Aikido fundamentals. 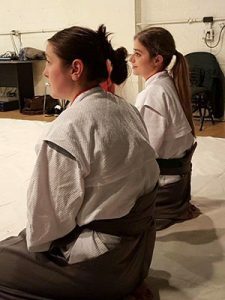 We don’t currently offer children’s classes, but youth ages 14 and up are welcome to join us with the permission of a parent. We begin setup and warm-up promptly on the hour. If you arrive early, please wait on the patio or in the small house at the northwest corner of the property until class time. The only cost to begin training Aikido is your time and commitment. There is no need to purchase a uniform (dogi) until you have tested for your first rank advancement. A gray hakama may also be worn from 5th kyu and up with black hakama reserved for yudansha (black belt rank). Once you have achieved your first rank, we invite you to help contribute to the dojo expenses according to the following fee schedule. Fees may be paid by cash or check at the dojo, or click on the button below to pay via PayPal. There is no contract required. *Maximum allowed period of free training is 30 classes or 6 months, whichever comes first.